I affirm the information I have provided in my application and in this declaration is true and correct and that any false information provided may lead to the cancellation of my enrolment at any time. The English Language School in Sydney will notify government agencies of any change to my enrolment which may result in the cancellation of my student visa. I understand and agree that information provided in this Student Agreement and collected during my enrolment is collected in order to meet the English Language School in Sydney’s obligations under the ESOS Act and the National Code 2007 to ensure student compliance with conditions of their visas and their obligations under Australian immigration laws generally. The authority to collect this information is contained in the Education Services for Overseas Students Act 2000, the Education Services for Overseas Students Regulations 2001 and the National Code of Practice for Registration Authorities and Providers of Education and Training to Overseas Students 2007. Information collected about me on this form and during my enrolment can be provided, in certain circumstances, to the Australian Government and designated authorities and, if relevant, to the Tuition Protection Service. In other instances, information collected on this form or during my enrolment can be disclosed without my consent where authorised or required by law. I understand and agree that before I can enrol in the English Language School in Sydney (ELSIS), I must satisfy the conditions as outlined in my Letter of Offer. 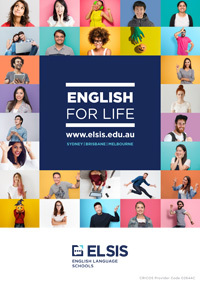 I understand and agree that I have the obligation to satisfy all of these conditions and if they are not fully satisfied on or before the date of the commencement of my English Language Course, I cannot commence the Course and the English Language School in Sydney may, at its option, terminate my enrolment. I agree to the English Language School in Sydney releasing personal information relevant to my application, visa documentation and initial Course enrolment to the English Language School in Sydney’s overseas representatives whom I have authorised to act on my behalf and to the English Language School in Sydney’s preferred OSHC provider. I have read and understood the description of the courses, facilities, classroom equipment and learning resources as described in the student handbook and have exercised my independent judgment in enroling in ELSIS. The English Language School in Sydney does not guarantee that enrolment in or completion of any ELSIS English Course will enable me to obtain any particular employment or to remain in Australia upon completion of the Course. I understand that I must have sufficient funds to finance both my tuition fees and living expenses for the duration of my course. I understand that the tuition fees do not cover the costs of books, materials, field trips or living expenses unless otherwise specified. I acknowledge that I have received information on the local environment in which I will be studying, including the location of the teaching site, accommodation and living costs. I understand that I am responsible for all educational and other living cost expenses of any person who accompanies me to Australia. I understand that all school-aged dependents accompanying me to Australia must attend school and are required to pay full fees if they are enroled in a government or non-government school. I understand that the current approximate cost of living in Australia is between $18,000 and $21,000 Australian dollars (AUD) per year (for an update check www.studyinaustralia.gov.au/english/live-in-australia/living-costs). Unless I have an ELSIS Release Letter, I am not allowed to transfer from ELSIS to another registered provider before I have completed six months of my Principal Course of study. If I have enrolled in only one course, that course is my Principal Course of study. If I have enrolled in and have CoEs for a packaged sequence of courses provided by ELSIS and any of its registered provider partners, my Principal Course of study is the course with the highest Australian Qualifications Framework Level, even if that course is not provided by ELSIS. This is usually a Bachelors or Masters Degree. Once I have completed six months of study in my Principal Course I will be able to transfer to another registered provider without an ELSIS Release Letter. It is determined that such a transfer is not in my best interests. Provide fraudulent, forged or deliberately misleading documentation in any circumstances relating to my status as an international student. Fail to enrol by the required date without approved deferment, suspension or cancellation of my studies. Fail to maintain satisfactory attendance. Fail to maintain satisfactory academic progress. Am guilty of serious misbehaviour and breach of the Student Code of Conduct. I understand and accept that notification of cancellation of an eCoE does not constitute a Release Letter. The continuation of my study is dependent on my compliance with my student visa conditions which include satisfactory academic progress and attendance and payment of required tuition fees before the commencement of each course. As an international student on a student visa, I must maintain a minimum of 80 percent (80%) average course attendance and satisfactory academic performance throughout my course. If I fail to meet these requirements I will be issued with a warning letter followed by an Intention to Report notice and may be subsequently reported to the Department of Home Affarirs (DHA) via PRISMS. It is my responsibility to seek assistance from the English Language School in Sydney teachers, counsellors and other support staff as soon as I experience difficulties with any aspect of my studies, and to attend learning support and/or counselling sessions if requested to do so. Attend all Course related classes, information sessions, supervised study sessions and assessment sessions and undertake all assessments. I understand and accept that timetabled day classes refer to both morning and afternoon sessions, or class-times and that ELSIS may change my timetable from one to the other. I understand and accept that while I am enrolled at ELSIS it is my responsibility to notify the English Language School in Sydney at least 7 days before I change my address. This is to ensure that any notification sent to me advising of visa breaches is sent to my current address. I have to arrive at the English Language School in Sydney no later than the date listed in my Letter of Offer. If I am unable to arrive by that date I must contact the English Language School in Sydney for approval to arrive late and/or deferment of my enrolment, otherwise, I may not be able to enrol on arrival at the English Language School in Sydney. If I fail to enrol within five working days of my course commencement date and have not applied for and been granted a Deferral of Enrolment, ELSIS will send me an Intention to Report Letter. If I fail to enrol within ten (10) working days of my course commencement date and have not applied for and been granted a Deferral of Enrolment, ELSIS will cancel my eCoE. If I cannot start my course on the commencement date due to visa delay or other unavoidable circumstances, I will be permitted to start my course only when the timetable and class capacities permit, and I may be charged an administration fee for a new eCoE for the new commencement date. ELSIS has the right to increase tuition fees and charges from time-to-time without notice. ELSIS imposes an Enrolment Fee and course Materials Charges, and these may be altered from time-to-time without notice. Administrative fees may apply for some requests such as course deferment, change of course, change of course start date, ECoE extension, and document replacement and re-issuing. Service administration fees are charged for accommodation placement and airport pick-up. I must provide proof of payment to the Overseas Student Health Cover scheme before I can be issued with a student visa. I understand and accept that I am responsible for paying all due fees before or on the due date, and accept that penalties may be imposed for late payment of fees. I understand and accept that I will not be enroled if I have not paid my fees and charges by the set enrolment date. I understand and accept that I may be excluded from classes and that my enrolment may be suspended for any period my fees remain unpaid. I understand and accept that I may be sent a “Non-Financial Intention to Report Letter” if I have outstanding unpaid fees and charges and I have failed to respond positively to ELSIS attempts to make arrangements for the full payment of outstanding fees and charges. I understand and accept that the Intention to Report Letter will inform me of my right to Appeal against being reported, within 20 working days of the English Language School in Sydney sending the Letter. I lodge an Appeal (Internal and possibly External) against being reported and then withdraw from the appeal process before it is completed. I understand and accept that if I terminate or complete my course but have unpaid fees and charges, I will not be issued with any Certificates and/or Statements of Attainment until all fees are paid. I understand that I have an entitlement to make internal and external complaints about facilities, behavioural and academic matters and to make internal and external appeals against decisions relating to academic and administrative matters, outcomes of complaints, and disciplinary matters. I understand that if I want to lodge an external appeal I can do so with the Overseas Students Ombudsman. The Overseas Students Ombudsman is free and independent. Find out more at www.oso.gov.au or phone 1300 362 072. Ensure that the English Language School in Sydney has my current Australian residential address for the duration of my studies. Shall make all reasonable effort to provide the Courses as advertised but may at its sole discretion alter any part of the Courses, and may postpone or cancel Courses. Does not guarantee that every course will be offered in any particular teaching period. Courses offered in any teaching period are subject to change by the English Language School in Sydney from time to time. Is obliged to notify Government agencies of any change to a student enrolment. I understand and accept ELSIS policies and procedures relating to the refund of tuition administration fees and charges as outlined in the ELSIS Application Form and ELSIS Letter of Offer.